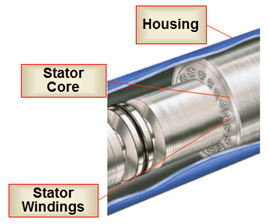 The stator is the core or electrical field of the motor. It is composed of the housing material for the desired diameter, the stator core, and the stator windings (as per the graph below). The housing material forms the cover for the motor and is threaded at both ends for head and base components. The housing can be of different diameters and its material can be chosen for different applications, depending upon the environment. 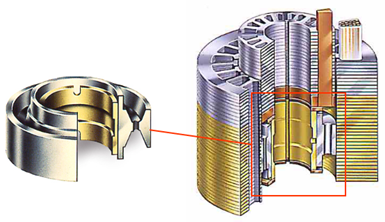 The stator core is composed of laminations stacked under pressure to insure a permanently tight core. Laminations are thin sheets of die-punched steel or bronze material (refer to the below photo). 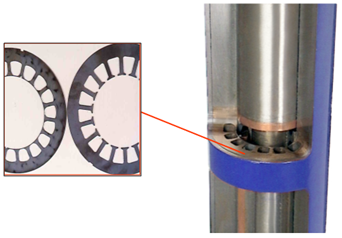 The stator windings are made from either Polyimide or PEEK material, for primary magnetizing winding wound through the die-punched slots in the stator core. 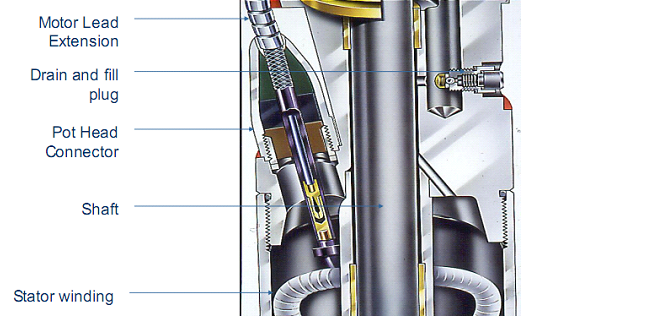 The rotor is a device that rotates inside of the stator core. The rotor is made up of rotor laminations that are smaller in diameter from the stator laminations and these create the iron core. Inside each slot are copper bars with supporting copper end rings. Because the structure resembles the cage used to exercise squirrels, rotors of this type are called “Squirrel-Cage rotors”. Rotor Bearings are one of the most vital parts of the motor. 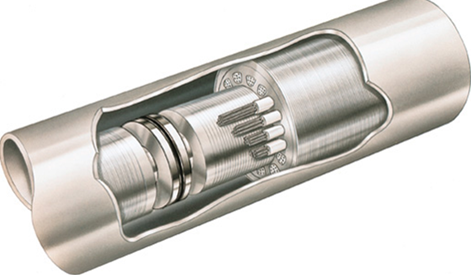 There are fluid holes to insure oil circulation and wide angle oil grooves on the OD to distribute lubrication evenly over the entire length of the bearing surface. The motor thrust bearing is installed at the top of the rotor string. It is designed to hold the weight of the entire rotor string. 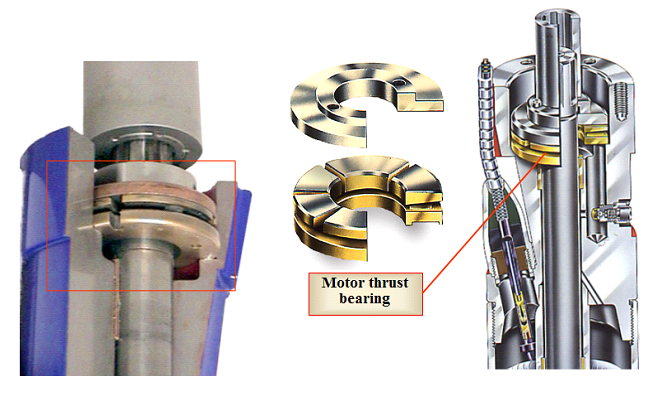 There are several types of motor thrust bearings. The thrust bearing limits will indicate the type of load required for the selected bearing material. The pothead is a key part to connect the motor with the power cable; its mechanical and end sealing ensure the long-term operation of the motor. Tagged artificial lift, baker hughes, compression pump, electrical submersible pump, energy, ESP motor, ESP motor compounds, floater pump, General Electric, housing material, ISO standard, Motor, motor compounds, motor oil, motor thrust bearing, oil and gas, Petroleum engineering, Pothead, production engineer, production optimization, production surveillance, production technologist, pump, Rotor, Rotor Bearings, schlumberger, Stator. Bookmark the permalink.